From the lower Barrowman Valley, scramble up onto this rocky ridge. Higher up, a snowfield gives a break, and there is enjoyable climbing on weatherworn rock slabs. Mixed ground then leads to the low peak. 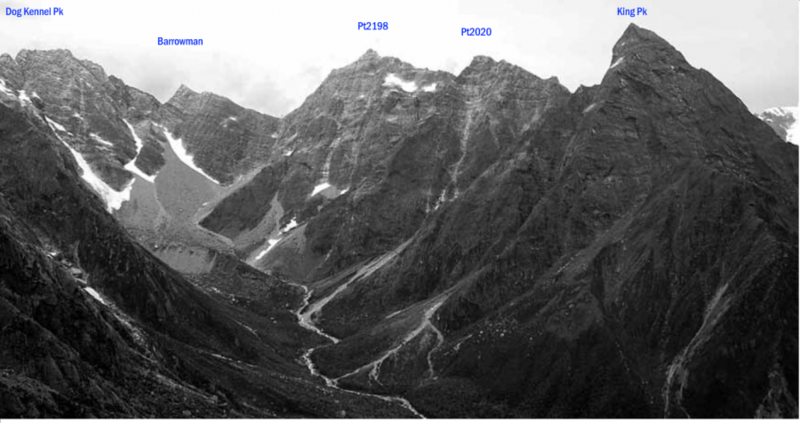 There is a descent and considerable climb from the low to the high peak and, on the first ascent, the route led north across a snowfield to a col on the North Ridge. Easy scrambling along that leads to the high peak. From the Butler River South Branch, ascend the snow gully that leads directly to the col between Pt 2198 metres and Pt 2020 metres and continue to the summit. From the Butler River South Branch head up the gully under the col at Pt 1838 metres, then north up snow slopes. From about the height of the col swing back to the left across broad ledges, a gully and steeper rock to the vicinity of the col itself. Follow up the South Ridge.